It wasn't the sternest slogan of the day -- "The murderer state will be held to account" is pretty tough to beat in that department -- but seven years after the killing of Armenian-Turkish journalist Hrant Dink, the simple, poignant words "Hepimiz Hrantız, Hepimiz Ermeniyiz" still pack a punch. We are all Hrant. We are all Armenian. 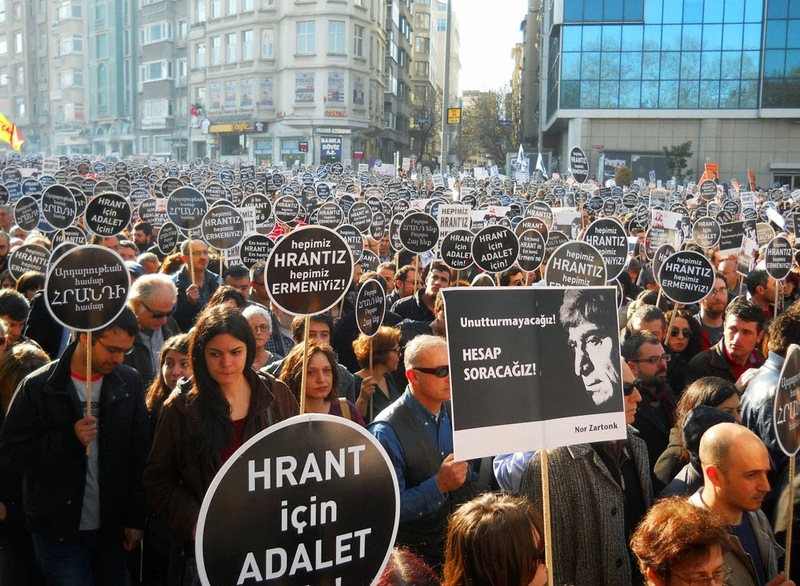 In a country that has often sought to downplay, if not entirely deny, the presence of minority populations, the appearance at Dink's 2007 funeral of this slogan on small black-and-white placards must have been a powerful sight. This year, some of the round signs, now a multilingual hallmark of the annual commemoration of Dink's death, had been adapted to show solidarity with those killed during last year's Gezi Park protests: "We are all Ethem. We are all Ali İsmail." The van leading the slow, solemn march from Taksim Square to the site of Dink's murder also broadcast a call for justice for Kurdish brothers and sisters killed in the Roboski massacre, for which no one has been held accountable two years on. Otherwise, the protest remained closely focused on the martyred champion of minority rights, who has become a symbol of broader demands for democracy and freedom. Few of the multitude of flags and banners usually seen at Turkish protests were in evidence, and those that could be spotted were swept to the edges of the sea of monochrome signs remembering Dink and calling for justice to finally be done in regards to his death. Near the offices of Dink's newspaper Agos, where he was gunned down in broad daylight, a handful of youths tore down flags for the nationalist party MHP and tried to get some breakaway chants going. But few in the sober, disciplined crowd seemed interested in giving the riot police who had gathered en masse any excuse to interfere, or in detracting for one moment from the man being mourned.